The WCMS will give a warning. (See image below) It will list all of the pages that link to (or use, if it's a PDF or image) the asset you're deleting. View those pages and edit them before deleting or you will break links on those pages. Since deleting also unpublishes, keep in mind that if anyone has bookmarked the page you're deleting, their bookmark will be broken. ***Publish the folder that had the asset. This will update the left navigation links. HELP! I DELETED SOMETHING AND I WANT IT BACK! 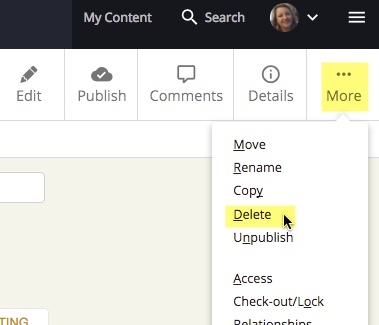 The WCMS stores deleted items in your "Trash" (link above your folder structure) for 30 days. 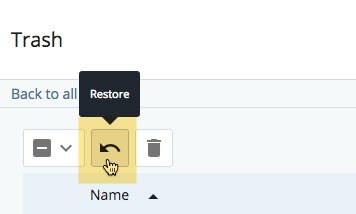 If you accidentally deleted something and it's within the last 30 days, just "Restore" the asset and re-publish it. If it was a page, re-publish the folder to update the left navigation.